Fighters from the militant group Islamic State of Iraq and the Levant, or ISIL, have seized 10 towns in the Salahuddin province of northern Iraq since Tuesday, government sources said Thursday. All but four towns in Salahuddin province — Tuzhumartu, Dujail, Balad and Samarra -- have been taken by the group. On Thursday, ISIL released a statement calling on its fighters to "creep" towards Baghdad, Karbala and Najaf to "settle scores" with Iraqi Prime Minister Nouri al-Maliki. "The real battle will be in Baghdad and Karbala," said Abu Mohammed Adnani Shami, who presented himself as ISIL's spokesperson. He called on fighters "not to cede an inch of seized land and to prevent Shia from setting foot on it." Photos published on a Twitter page believed to be operated by ISIL showed them using bulldozers to remove barriers on the Syria-Iraq border and crossing into Iraq with military vehicles. An Anadolu Agency correspondent said the group held a military parade in Mosul, which they seized on Tuesday. Kurdish Peshmerga forces have prevented ISIL forces from entering Tuz Khurmartu. In Samarra, which has a special status because of the presence of a revered Shia shrine, Iraqi special forces arrived early Thursday to protect the city. ISIL militants have already seized the northern province of Nineveh, including its main city Mosul, and Tikrit, only 140 kilometers from capital Baghdad. The ISIL militants have advanced further south closing in on Baghdad, according to an AA correspondent. 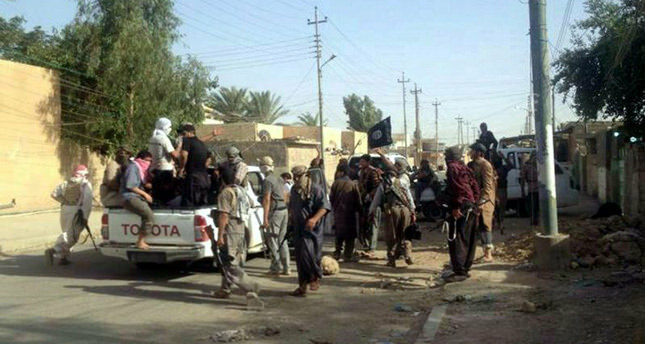 Militants also control the western province of Anbar, where they have long had a presence. A Kurdish security source told the Anadolu Agency, on condition of anonymity, that Kurdish Peshmerga forces engaged in an hours-long clash in Sinjar, west of Mosul, with fighters crossing into Iraq from Syria on Thursday morning. The source said three Peshmerga troops were wounded and 20 of the militants killed, with the rest abandoning their equipment and fleeing towards the Syrian border. In the northern oil-rich city of Kirkuk, Iraqi and Kurdish Peshmerga forces are preparing to take back the Hawija and Rashad areas from ISIL, Serhat Qadir, the head of local police, told the AA. Forces deployed in Kirkuk's Multaqa sub-district, just 24 kilometers from the city, are under ISIL's control. Other parts of Kirkuk are under control of Peshmerga forces, but residents are stockpiling food and gasoline in case of a possible ISIL attack. There has been a 10 percent increase in the price of food and gasoline in Kirkuk and the price of propane has more than tripled. Following the violence in Mosul a curfew was placed in Kirkuk between 11 p.m. and 4 a.m. on Wednesday. That has exacerbated the situation in the town, said local resident Huner Tahsin. Earlier Thursday, unidentified people looted military headquarters, which had been evacuated after an ISIL threat, taking all military vehicles, weapons, handcuffs and military uniforms. Neither Kurdish Peshmerga, nor the Iraqi police, intervened to stop the looters who reportedly were carrying heavy weaponry. On Thursday, Iraq's army appointed new commanders to head operations in the northern Salahuddin province, said officials. Late on Wednesday, Iraqi Prime Minister Nouri al-Maliki ordered the arrest of military leaders who reportedly left their posts when ISIL militants attacked Mosul, a source close to the prime minister's office told the AA on condition of anonymity. ISIL was established shortly after the U.S.-led invasion of Iraq in 2003 and was most recognizably known as Al Qaeda in Iraq, under the leadership of Jordanian militant Abu Musab al-Zarqawi. Al Qaeda's leader Ayman al-Zawahiri cut ties with the group in February 2014 because of a dispute with another militant group, the Al Nusra Front. Iraq has seen a marked increase in violence in recent months, which the government blames on ISIL.